A house plan this grand might be mistaken for Downton Abbey, but rest assured it would make a fabulous home anywhere. If you are planning to build on a scale like this, you are without a doubt studying the many luxurious features very carefully. There is certainly nothing plain or simple here from the shapes of the rooms to the placement of the stairs. But please notice even in all its lavishness, it delivers a great house plan that is user friendly especially in the small details. Just off the kitchen lies a family gathering hall, away from the formality of the reception hall and grand foyer. Outside the kitchen, an herb garden provides the freshest ingredients for family meals. Upstairs the student’s retreat provides peaceful privacy for a developing mind. Imagine yourself walking through the rooms of this opulent home and notice that you are never very far from one of the eight bathrooms, even if you are at the pool or in the garage. 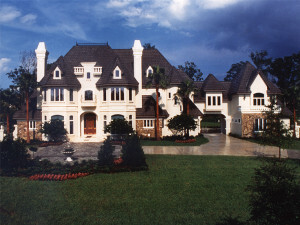 This European-styled, two-story design certainly exhibits extravagance with purpose. How cute is that? 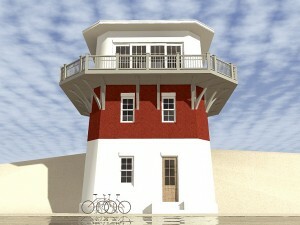 This house plan, with its Cape Cod style, looks remarkably like a lighthouse. It’s just begging for a lot on the seashore. Two bedrooms and a full bath are snugly tucked away on the lower walk-in level. Just up the stairs locates the busy part of the home, which includes the kitchen, laundry facilities, and dining area plus a half bath. Going up one more level you’ll find a nice open room with access to a balcony that wraps completely around the house. To most, it’s called a living room but with an awesome 360 degree view, maybe it should be called a dream room. With its accompanying full bathroom, a person could spend the entire day up here. What a cozy nest for newlyweds. Or better yet, share it with the family as your very own vacation getaway. Whether it’s located on the beach, lakeside or in the middle of an enchanted forest, this unique home plan with a view can only bring a smile to your face. Oh yes, leaving the lights on is optional. If you’d like to view more unique house plans like this one or others with similar Cape Cod charm you’ll find plenty to browse in our designated home plan collections. Short on space but big on ideas? This unique house plan is perfect for those that are looking to do a lot with little by allowing you to make the most out of your space. The ground level is barrier free with zero walls, creating an open environment ensuring that space is not lost due to walls taking up space or creating corners that are inaccessible. This results in a perfect area for hosting parties, gatherings, or simply lounging with friends and family. It promotes a community feel as individuals are allowed to mingle in one collective area. The large floor to ceiling windows contribute to this open impression by allowing plenty of natural light to enter in addition to seamlessly blending the ground level with the joined patio. The upper level serves as a great juxtaposition to the lower level providing a great amount of privacy within its three bedrooms and two baths. Located separately from the common areas downstairs assures that noise won’t as easily disturb those sleeping. For those looking to build in urban areas where space is limited, this modern two-story house plan can make a narrow lot feel like a whole lot more. 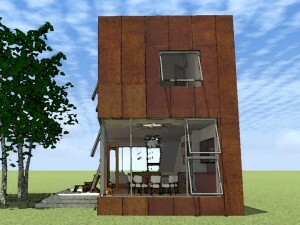 For more contemporary house plans please view our entire collection.